The dining area leads to the well equipped, fitted kitchen with dishwasher, double oven, electric hob, microwave and fridge. The floors are slate. Two steps lead up to the hall off which are two bedrooms, a twin (or superking) and a kingsize (or twin), a bathroom and separate shower room. Bed linen and towels are provided. Ample parking space for cars and boats etc and storage for cycles in a lock-up garage. A separate laundry room at the rear of the cottage has a washing machine and tumble dryer which guests may use. A beach hut is available for guests occasional use during their stay between April & September. A BBQ, chiminea, garden furniture and sun loungers are provided in the private suntrap garden. We are pleased to be able to offer our guests Aromatherapy Treatments including Full Body or Back massage, Reflexology, Reiki, Indian Head Massage, Facial, Manicure & Pedicure in conjunction with "Essential Wellbeing". Or you can enjoy a painting session with our visiting artist Leah Green - Who will guide you step by step to paint a unique souvenir of your holiday with us on the Llyn Peninsula to take home as a lasting memory. 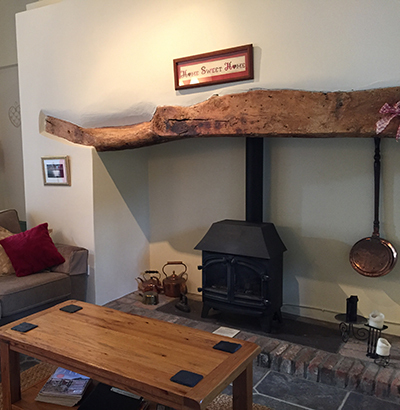 The sitting room has the original inglenook fireplace, with gas wood burner effect stove and beams. It is safe for children with a private secure garden and who are welcome to use the paddocks to play in. There is ample parking space at the front of the main house for cars and boats etc. and storage for cycles in a lock-up garage. We are sorry that pets are not allowed in the cottage. Changeover is generally on Saturday - except short breaks. 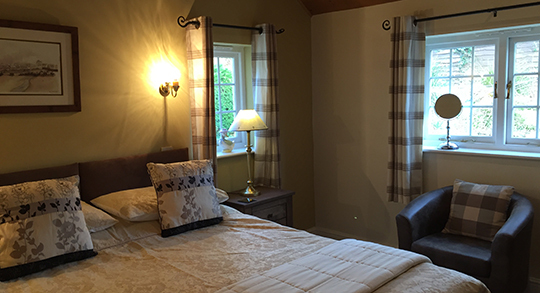 Rectory Cottage check in time is between 4pm and 6pm and departure by 10am except by prior arrangement. Early or late check in / check out can be arranged and may be charged - subject to availability and prior notification of at least one week. The prices are per week and include bed linen, bathroom and kitchen towels, gas and electricity. Cot and high chair are provided free of charge. There is a charge of £25 for an additonal fold up bed for children. A £100 deposit is required for all bookings with the balance payable 6 weeks before arrival. A security deposit of £100 is also payable which will be refunded, after departure, once the cottage has been checked and found free from damage. Please use the Booking Enquiry Form or use the Contact details below for any Email or Telephone enquiries. All deposits are non-refundable and the full amount will be charged in the event of cancellation less than six week prior to arrival unless we are able to re-let the accommodation. Guests may wish to arrange insurance to cover them against cancellation.